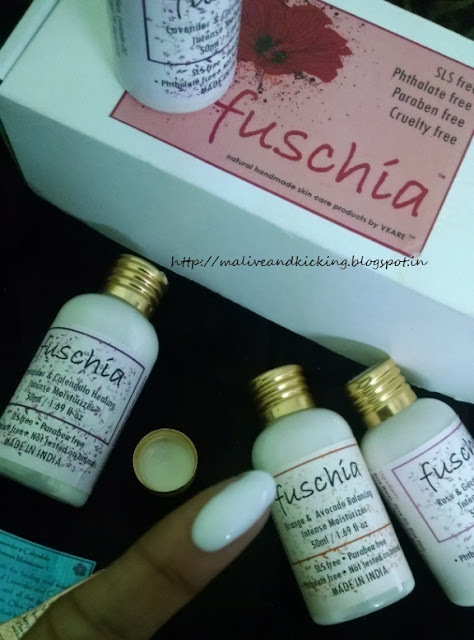 Fuschia is a brand whose products can be bought and used blindfolding your eyes. I have much of faith in the efficacy of their soaps, scrub, night cream etc. And the team is so considerate that they keep on formulating newer products to offer more n more natural skin care benefits to its customers. Recently, the brand launched their intense moisturizer range. By range, I mean they didn't come up with one or two, but five variants of the moisturizers with choicest ingredients in each of those. I received four bottles individually packed in cute pouches. 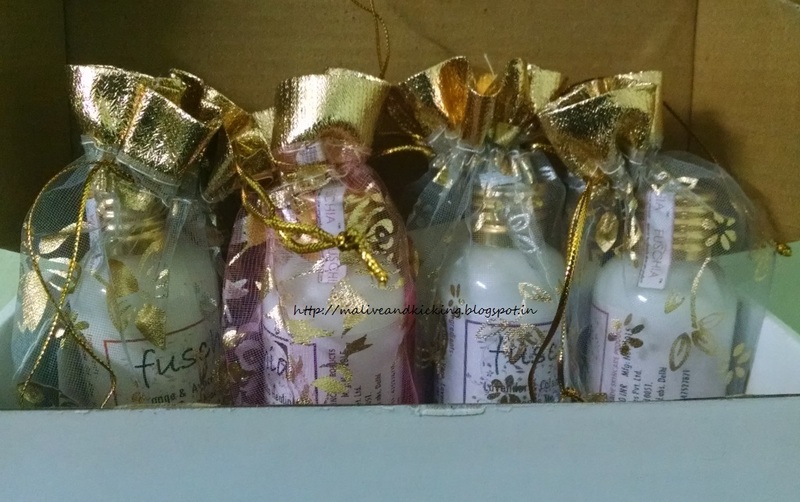 Packaging: All the moisturizers are packed in light weight, good quality plastic bottle that are easy to carry around. With no unnecessary detailing, the brand has thought of concentrating more on product quality and kept the bottle decently simple with golden screw cap and ingredient list and pricing details printed on it. The bottles are tape sealed on the top and accompany a little note reading its fine details. Variety: Each of us has one or the other favourite fragrance that stimulates our senses. It usually happens with me that I love a product for its performance, but wish to have it in my fav scent. Fuschia has taken care of creating 5 beautifully fragranced moisturizing lotions so you may pick one or two of your choice. To quickly jot down the variants, they are offered in Orange & Avocado Balancing Intense Moisturizer, Berry Blend & Apricot Clarifying Intense Moisturizer, Lavender & Calendula Healing Intense Moisturizer, Lemongrass & Lime Revitalizing Intense Moisturizer and Fuschia Rose & Geranium Cleansing Intense Moisturizer. Pack Sizes & Pricing: All the variants of moisturizers are offered in two sizes. Those who feel the need of testing the product before final purchase can try 50 ml pack and later switch over to 100 ml pack, if suitable. 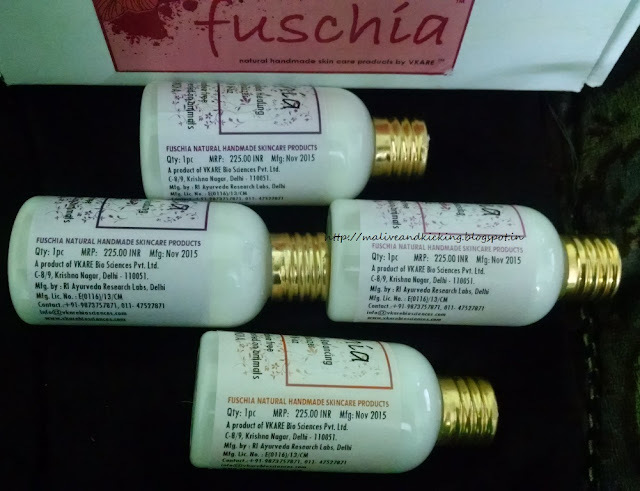 The 50 ml pack is priced at INR 225 and 100 ml pack is priced at INR 450 each. Current the moisturizers are being sold at 12% discount here. Texture, Smell and Feel: As the product name indicates, all the moisturizers are conceived with the thought of giving deep hydration to skin. They not only make skin feel soft but the dry, flaky skin instantly gets a coating of sheer nourishment of superior constituents. None of the moisturizer feels heavy on skin leaving an oily or sticky layer behind. 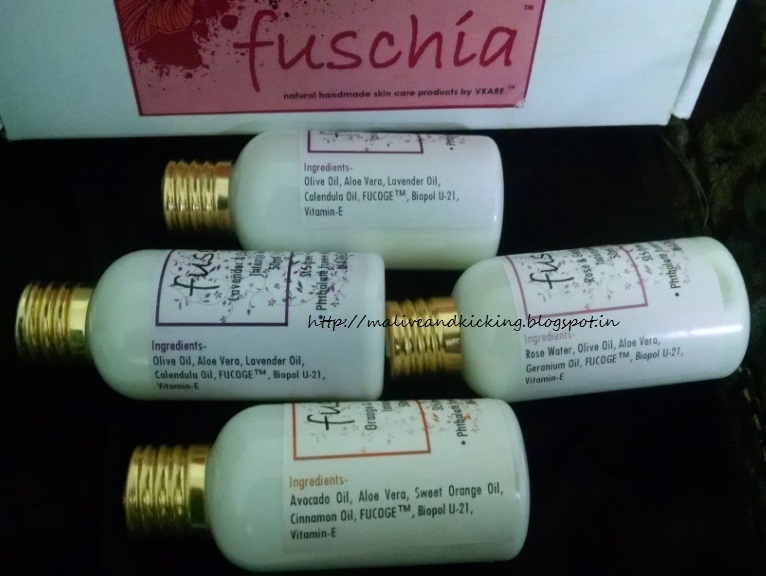 The fragrances used are so superlative and soothing that they leave you enjoying its mildness for some time. Utility: These moisturizers are appropriate to apply of any part of the body including face. So we need not to stock up different emollients for hand, face and body etc. 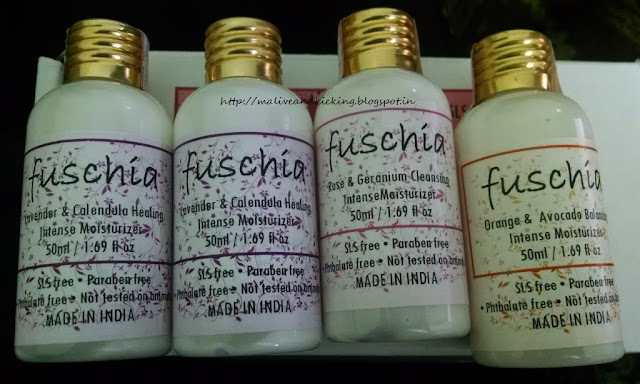 Chemical Free Composition: Though its but obvious, but I would not forget to mention that all the products on the shelves of Fuschia are praised for being cruelty free, SLS free, Paraben free and phthalate free. So everyone including people with the sensitive skin or children can use these products without any worries of skin allergies etc. 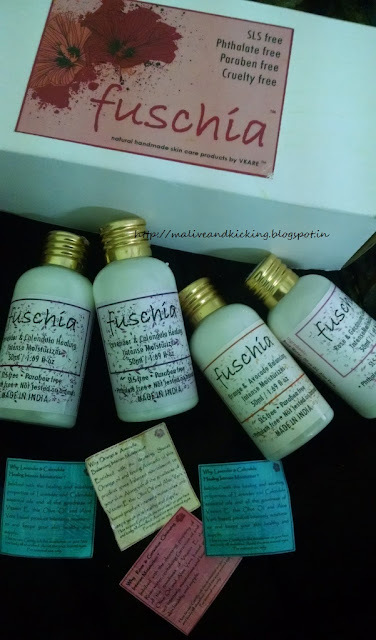 To conclude, Fuschia has given me one more reason to fall in love with their natural products. I have scattered the moisturizer bottles at the places where I can access them whenever required like my washrooms, bedside table and ofcourse my handbag. I'm genuinely not able to sort them in order of my liking since each one is performing much better than my expectation. My strong recommendation for the Fuschia Intense Moisturizers!! The packaging is so festive and cute! All these moisturizers sound amazing. I have to give these a try.